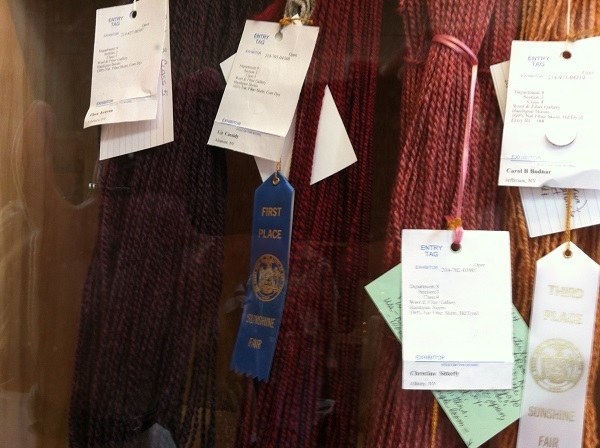 Those would be my ribbons at the Cobelskill Sunshine Fair! 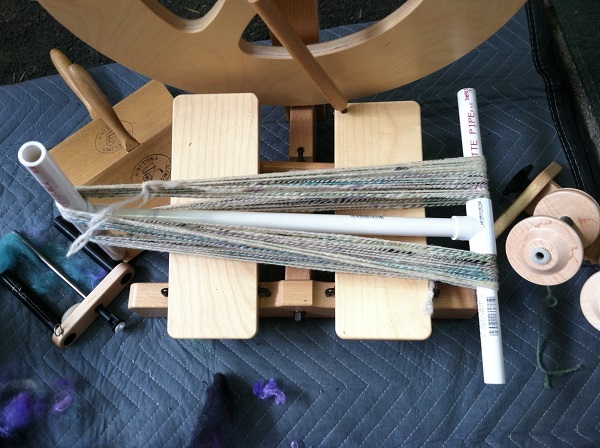 On the top is a first place in the natural colored wool class. 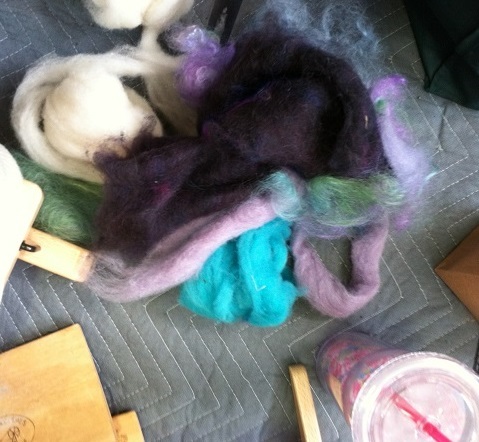 In the middle is a first place in the commercially dyed wool/wool blend class. 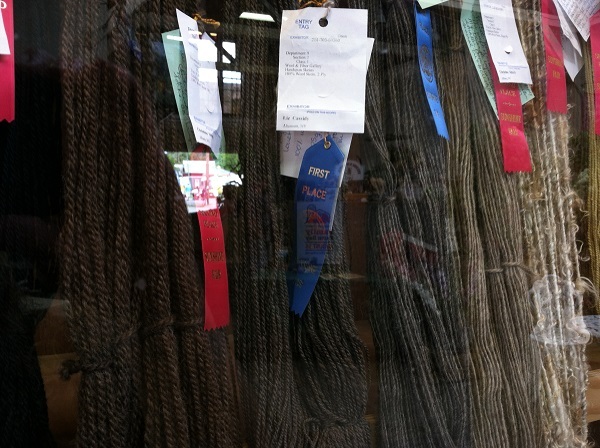 On the bottom is a second place for large knitted wool item class. It was so exciting to see my stuff in the case with those ribbons and I was really happy with how well my items did. I was dying to add beads but I couldn’t for the life of me figure out how to do that. Whew! It was a tiny bit exhausting. But, I sat next to a very nice woman named June with whom I chatted and she kept everything light and funny. She was so prepared and brought a table for all her things (which I wished I had done) and a scale (which I also wish I had done since I just guessed how much half my wool was and my plies were pretty uneven in length) and a cowbell for ringing whenever they announced how much time was left (which I didn’t really wish I had done since one was enough – but so funny!). 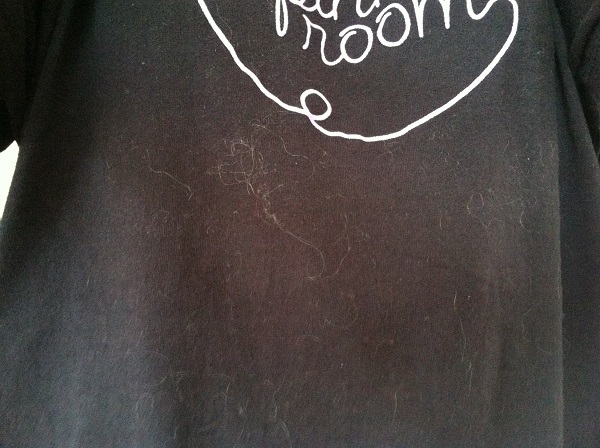 All that wool and mohair and silk from my pantry ingredients gets everywhere when you are fiddling with it. To clarify, EVERYONE got a first place ribbon for participating. But I did get an honorable mention and won that beautiful pottery mug (for my tea!). Really, the point of the whole “competition” was to have fun and it really was. Next year, it will be more fun for me now that I know what to expect, and now that I know to bring a table and a scale and not wear a black shirt. And figure out how to add beads. 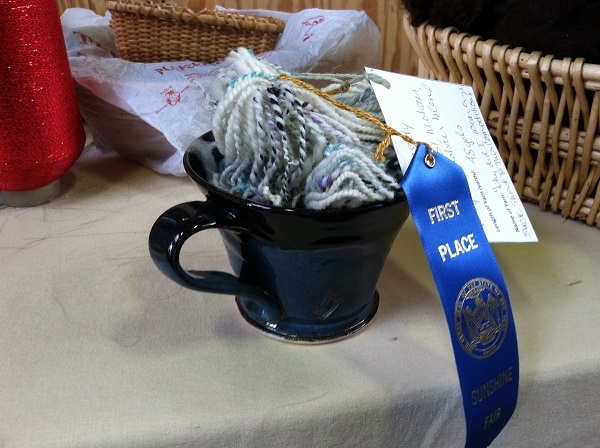 Posted in Uncategorized and tagged cobelskill sunshine fair, dorset, iron spinner, ribbons on August 1, 2014 by lizytish. Congratulations on all your ribbons! So proud! Way to go, Liz!! Congratulations! Great job! And do you ever NOT have fun at anything? You strike me as a very happy, upbeat person. Thanks Bea! It really was fun! Congratulations! 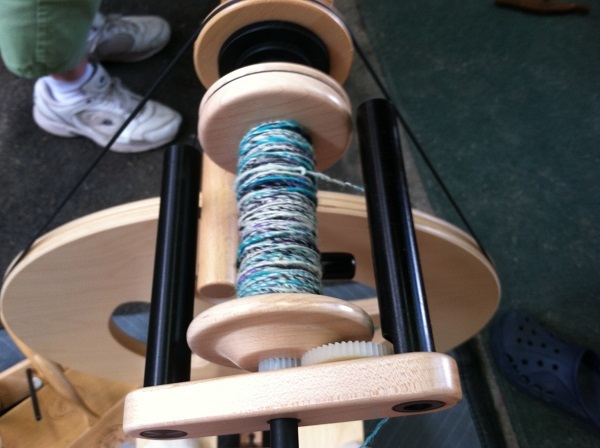 That skein is so pretty. Love that Iron Spin concept. What the heck, that PI shawl is a Grand Prize winner in my book! You wuz robbed! Thanks Libby! The winning shawl was gorgeous and knitted by a MUCH more experienced knitter than me. Congratulations, Liz! I wish I could have watched the Iron Spin – sounds exciting. 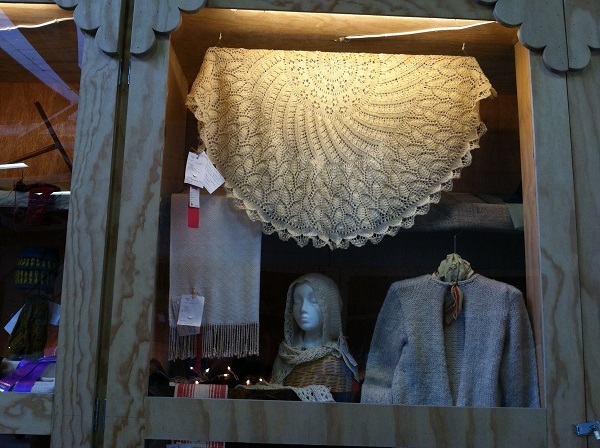 I agree – the Pi shawl definitely was a blue ribbon project! Congratulations on your ribbons, however I can’t believe that something else beat out that beautiful white round shawl. Do you know what it was that did? Again congratulations!!! And I have to look it up before next year’s competition!